Laura and David got married in Fladbury church near Evesham, and then went on to host their wedding reception at the Wood Norton Hotel. I spent the entire morning with Laura and her bridesmaids, whilst my associate photographer Aaron had spent the morning with the groom and his ushers. When I arrived at the church that morning, I spoke with the vicar who was taking the service to make sure that they were happy with where I wanted to stand to take pictures during the wedding. 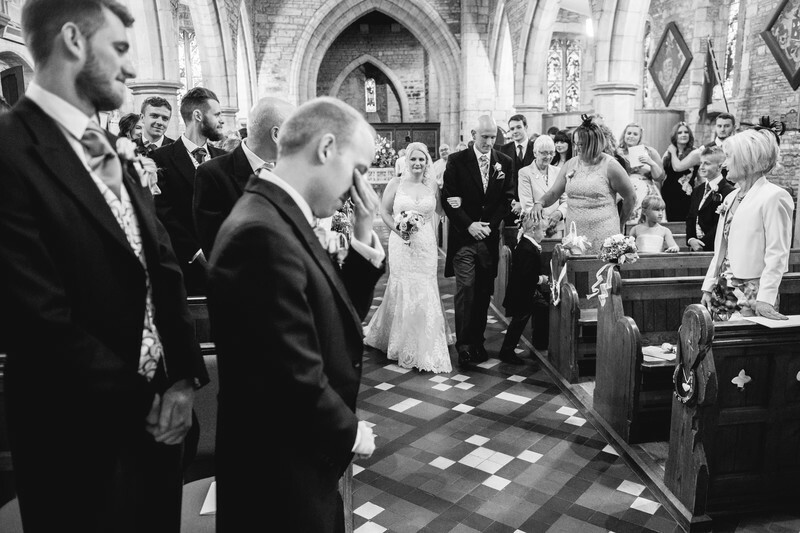 I picked out a good spot at the front of the church, and the vicar was even kind enough to stand to one side as Laura walked down the aisle towards David, whilst being escorted by her older brother. It's always an interesting time at a wedding, at the exact moment the bride makes her entrance as you never know how the groom will react. Some grooms are visibly nervous or anxious in the build up to the wedding, whilst others don't seem bothered or even try to put on a macho exterior, but when those doors open and the bridal party enter, you never really know how the groom will react. In terms of photography, by favourite reaction is always that of emotion, as these make for the best wedding photos in my view! They go so far in terms of telling the story of the day, and the bride will always get to look back and see just how happy their husband was on the day of their wedding.